Going to attend a Salesforce developer interview soon? Preparing for it already but don’t know what exactly they are going to ask? Are you worried and want to know how to answer questions? If you found yourself nodding to these questions, then give this post a good read. In today’s articles, we are going to tell you some of the common Salesforce developer interview questions that are often asked during Salesforce developers interviews and how you can crack them by answering straight to the point. Continue with your read to find out! 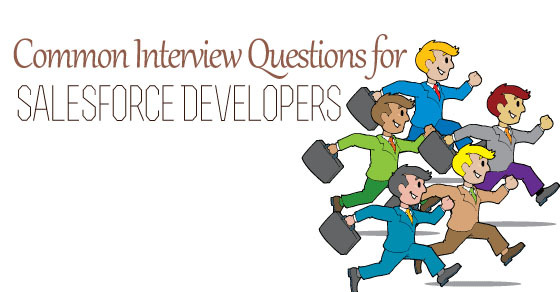 The following mentioned are few top interview questions on Salesforce developer with answers. 1. How will you describe an apex in Salesforce? 2. What is common between Java and Apex? A second question that will definitely be asked during interviews is the common points between Apex and Java. You first have to mention that both of them have classes, have common OOP features, have inheritance as well polymorphism. They also have the same expression and variables and are also capable of looping syntax. They have the same block and statement syntax too. The same object and same array is also a common point. They are all compiled, typed strongly and transactional too. 3. How will you describe a salesforce visualforce? Visualforce happens to be a component which has an interface framework used for the force platform itself. The framework also consists of markup languages that are tag based and is similar to HTML too. Each of the visual force tags will correspond to a coarse as well as fine grained user interface component such as an entire section of a page or even on the field. Visual force will also boast about the built in companies and the mechanism too which the developers could create for their own company. Visual force pages are also designed and made in such a way that they will react differently depending on the clients such as the ones on mobile or touch screen device. There are optional server side call outs which could be made to other web services. 4. What are class constructors? 5. What are class access modifiers? All classes have been given different access levels although it has a lot to do with the keywords that are used in the field of class definition. They are global which means that the class can be accessed from anywhere. Second, all the methods or variables that are used with keywords should be global. Third, all the methods have to deal with mailing services that are available around the world. Fourth, they have inner classes which are global within the global class that can be accessed easily. Public and private also exists here. Public happens to be the class which is easy to see on the application whereas Private can be seen as an inner class that are no default access level for other classes that are top level. 6. Describe a salesforce junction object and its use? Junction objects salesforce has been used to build several relationships between the objects. You have to take a recruiting application example too where the position for a certain job can be linked with several candidates in the same manner, a candidate could be compared to several other positions. So in order to keep a connection with the data model, you also need to have a third party object which has also been referred to as the junction object. The job application can be understood as the junction object here. 7. What is the difference between Salesforce object query language and Salesforce object language search? This is a very important technical lead interview question that you will be asked during sales force interviews. Knowing the difference between Salesforce object query language and Salesforce object search language is highly necessary. Salesforce object query language has one object that can be searched for at one time whereas there are many objects that could be searched for at a time. Second SOQL will have queries in all kinds of fields whereas query can only be used in emails, phone and texts. Third, SOQL will be used for all classes and triggers whereas Salesforce object search language could be used for classes but not triggers. 8. How will you define a custom object? Custom objects have nothing apart from database tables. Not only does it store data that is related to the company but also helps you define custom objects. Some of the things you should mention while answering this question are that how you can create custom fields, how you can associate with the custom object and the other records. For the custom object, recording tracks, events and tasks. Third, building page layouts is also important. Fourth, creating a custom tab for custom objects is a must. You should also speak about the analyzing of object data which can help in creating dashboards and reports. Finally, talk about how it can help in sharing custom tab, custom apps and custom objects. 9. What are the reasons for data loss? Data loss could cause due to several reasons. It will change data and change date time. It will alter a percent number and the currency for other data types. It will also change the multi select picklist, the checkbox, the auto numbers to other types. Next, changing the text area to URL, phone and text could lead to data loss. Finally, changing to auto number apart from text! Altering to picklist for any other type of picklist is also a good reason. 10. How can SAAS help in the salesforce? A Saas could be described as a subscription where customer are always free to choose if not renew in case they are not satisfied. The customers could also avoid a large chunk of initial investment which is in the IT infrastructure or the day to day hustle of maintaining infrastructure. Saas customer service will also give you the same infrastructure and is also easy when it comes to integration. It also provides the best and latest platform to the customers with innovation. 11. Talk about the different reports in salesforce? There are four kinds of reports you will always find in salesforce. First of all, there is a tabular report which will always display the whole total in the form of a table. Second, if there is a matrix report which is detailed and when the grouping is done, is based on the rows as well as columns. Third, it’s about having a summary report which is detailed in the form of report where the grouping is done based on columns. Finally there is a joined report where a report or two could be joined in single ones. 12. How will you describe object relationship interview? Object relationship interview is a common question which is asked in salesforce that can be used to link custom objects and records to the standard object records in a list that is related. You could also define the several kinds of relationships by coming up with custom relationship fields on a usual object. 13. As a salesforce developer, how can you help the marketing team? SDFC has something called professional edition which will allow you to create and track several marketing campaigns in order to measure the success and can also automatically feed the lead to sales teams. It will also allow mass emails to be given to prospect lists or even existing contacts to stay in touch with the different sources of revenue. For answering this question, we assure you don’t have to take the trouble of doing any research. How you can answer this question can be given to you right here. Start off by saying that Salesforce is a company that began with the hope of reinventing CRM which is also known to us as customer relationship management. Since they have changed the ways in which enterprise software is used and delivered, it has changed the whole look of the industry. All the products in salesforce will run in the cloud since there have been no expensive costs of setups or even maintenance and the employees have been able to work from any device that has an internet connection. 15. What do we usually do in the sales organization? Since the company is about sales, this is how the question should be answered. SDFC is a contact as well as pipeline manager that will allow the sale reps to function in a manner that is far more efficient no matter where they could be physical. Not only will the product keep a good track of all the contacts and the leads or accounts, partners, competitors and opportunities, it will also show how it integrates tightly with Outlook and the other mail clients so that calendars can be synced. There should also be associate mails with a proper system of contact. The salesforce technical interview questions that have been mentioned above are some of the basic questions you will be undoubtedly asked during interviews. So read them thoroughly, understand and practice before you attend the interview. This will help you answer confidently this interview question on salesforce and stop you from fumbling. Once you have got the job, here is something you should remember. It is normal to say no when there is something wrong. Most importantly you should mail them when things have gone wrong. The workforce rules have been set up in the right way that will allow you get better mail notifications around anything. You could also be notified when sales have been made, when new leads have been created and when a good opportunity has been lost and any other problem you can imagine. Always have salesforce work for and that will make life much easier. This brings the post to an end. If you have enjoyed reading this post and would like to give us some of your feedback, do let us know by leaving a comment in the box below. We would love to hear from you. Also if you have questions in mind, don’t forget to ask them either. Although we cant promise to answer every single one of them, we will try our level best to solve all your doubts and queries. On that note, good luck and here’s hoping that you have a fantastic interview.